GOMA, DR Congo, Nov 7 2012 (IPS) - Dairy cattle are again grazing on the rolling green hills of North Kivu province, in the eastern Democratic Republic of Congo. Twenty years ago, an explosion of ethnic violence tore through this region, and the restoration of the Lushebere farm can be seen as both a sign and a guarantee of a fragile peace. 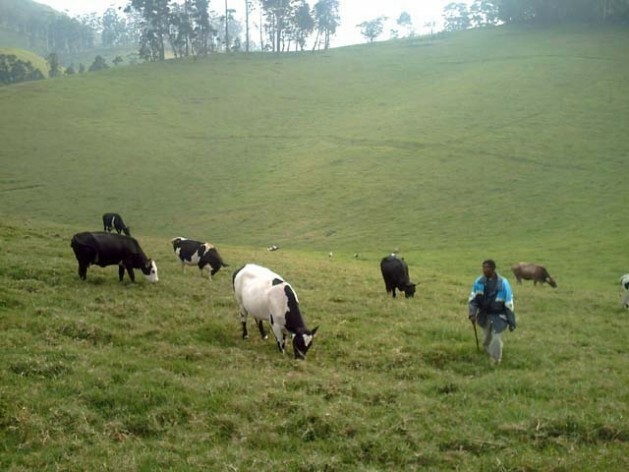 Established in the 1960s by a priest named Carbonel, the Lushebere farm was forced to close in 1993 when serious ethnic clashes broke out in March of that year at Ntoto, in the Walikale territory, before spreading into other parts of North Kivu: Masisi and Rutshuru, as well as into Kalehe, in neighbouring South Kivu. Houses, fields, schools, health centres, markets and churches were all burned, and livestock slaughtered or driven off by opposing militias. The farm’s managers were forced to suspend activity while many families fled Masisi to the provincial capital, Goma, or into neighbouring Rwanda and Burundi. During the ten years the farm was closed, the eucalyptus trees there were cut down and sold to pay wages to the workers who remained behind to guard the property. Across this region, where charcoal is the only source of fuel, illegal felling of trees is on the increase, even within the national park. “Nine out of ten households use this black gold for heating and cooking,” said Emmanuel de Mérode, director of the Congolese Institute for the Conservation of Nature. “Since 2003, we have planted 20,000 eucalyptus trees to replace those which were cut down and sold,” Father Diogène Harerimana, director of the farm, told IPS. The 558-hectare farm began operating again in 2003 thanks to a 33,000-euro donation from Saint Ave-Goma Entraide (SAGE), an association created in France in 2002 to help build peace among the ethnic groups in Masisi through shared economic activities. The funds arrived to the farm in the form of equipment that had already been purchased. SAGE has also provided the farm with a cold room to store its milk products and a 4×4 to transport them to market in Goma. In July, the farm received another grant of 61,000 euros, this time from the Rotary Club of Vannes, a city in the west of France, and from Rotary International. This money has gone towards new equipment for pasteurising and packaging the milk. A technician from the European company which sold the machinery to Lushebere visited the dairy to train employees on how to maintain the equipment. “We are now functioning autonomously,” said Harerimana. With the new equipment, the farm is now packaging milk in one-litre bags which sell for a dollar each, though the daily output is still no more than 50 litres. “Residents of Goma and humanitarian aid workers within a 20 kilometre radius (of Lushebere) are slowly getting used to this packaging for the milk,” said Harerimana. Lushebere’s dairy herd now numbers 420, still far short of the 2,000 cows it had in 1990. The farm also had 1,000 employees 20 years ago. Today it employs 60 workers, with monthly salaries of between 25 and 130 dollars. But since July, the farm has been able to increase production of cheese from five to 35 kilos per day. “Now, our milk is first tested to detect any traces of bacteria before being transferred into big tanks and processed into cheese,” said Harerimana. The rounds of cheese are sold for five dollars a kilo, compared to three dollars/kg for cheese produced elsewhere – a premium consumers are willing to pay because it’s made from pasteurised milk. “What’s rare is dear, and what’s dear is rare,” said Jacques Bonana, one of the farm’s customers. Bonana works for a humanitarian agency at the Lushebere displaced persons camp. Many people agree that the dairy is the best in the region, said Charles Balume, owner of a restaurant in Goma, the capital of this eastern province of the Democratic Republic of Congo. In this region, where suspicion and mistrust between people and communities linger, Monsignor Théophile Kaboy, the bishop of Goma, doesn’t hide his concern. He fears the return of militiamen from Ntoto: the Raïa Mutomboki (meaning “we’re clearing non-natives” in Swahili) who often fight against the Nyatura (which means “erase and uproot the so-called natives” in Kinyarwanda). Each militia is supported by politicians.